Developed for Metropolitan Housing Trust (MHT), this exciting mixed-use project redeveloped a vacant site in Hackney, at the corner of Stoke Newington Road and Barretts Grove. 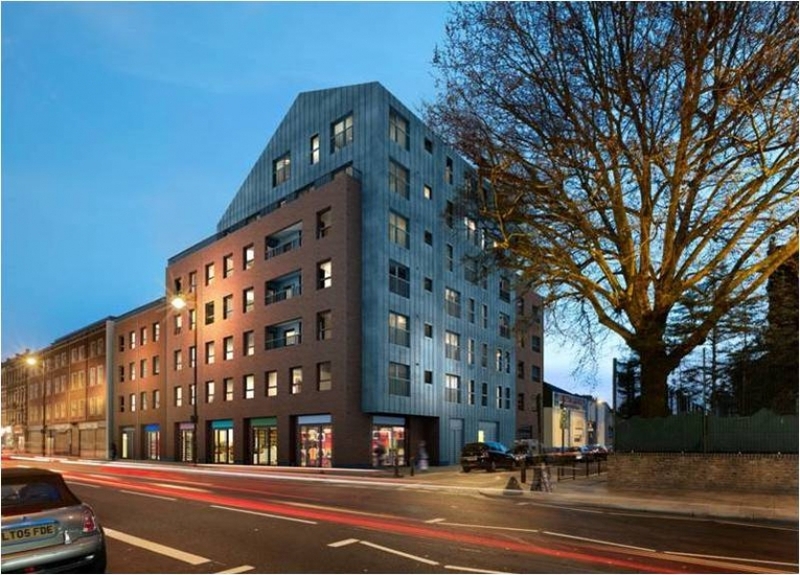 The scheme provides 38 mixed tenure apartments located around a central courtyard which is elevated one storey above 440 sqm of retail space, to provide new homes and shopping facilities. A four storey brick volume along Stoke Newington Road continues the existing street–scape; tying into the surrounding context. The brickwork is in two subtly different shades of red brick reflecting the rhythm of the building widths along the street. The volume steps up two storeys at the corner to create a strong presence on this prominent corner. A seven storey zinc-clad volume intersects the brick of the rest of the building and overhangs the shop fronts below creating further articulation to the corner. The dwellings provide a mixture of social rented and shared ownership flats, ranging from 1 to 4 bedrooms. Benefitting from large windows, all flats have juliet balconies or external terraces. The central courtyard provides a combination of private terraces and communal open space and was conceived both as an enjoyable space to use and to provide attractive views from the flats above. Planning permission was obtained in March 2012 and the scheme was completed in 2013.